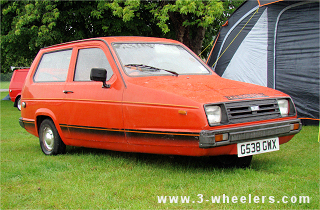 The Reliant Rialto succeeded the Reliant Robin in January 1982. Whilst there were a few similarities with the Robin the Rialto was in essence a completely new vehicle. 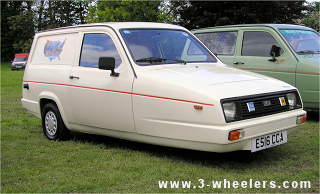 The new wedge shaped fibreglass body was now mounted onto a galvanised chassis (though some late Reliant Robins were also reported to have had a galvanised chassis). Power was again delivered by Reliant's 850 cc aluminium water cooled engine and with the added aerodynamics of the vehicle’s shape, the Rialto was a much more stable vehicle at speed without the need to fight the steering wheel. The Rialto came in three body types, the saloon, estate and van and now featured only one windscreen wiper that was centrally located to clear the whole windscreen. In early models, access to the rear luggage compartment was via a small hatch sitting below the rear window which proved awkward when trying to place parcels in the rear above the level of the hatch. In 1984 a Rialto 2 was produced with an 850 cc HT-E engine and high ratio rear axle. The engine itself featured a yellow rocker cover which was the only visible difference between this and the standard Rialto engine. Reliant engineers had increased the engine torque by 7.3% to 49.5 lb.ft which resulted in a 14.3% reduction of engine speed. This new Rialto had a claimed fuel economy of 73.3 mpg gallon and despite having decreased power (37.5bhp instead of the usual 40bhp ) it was said to race past 90 mph with ease with a top speed in excess of 100 mph. In 1986 the Rialto SE was introduced and the HT-E engine had been dropped in favour of the original engine and improvements to the body had been made with a hatch back type door on the saloon models. In 1985 a special "Jubilee" edition of the Rialto appeared to commemorate Reliant's 50th birthday. The actual number of Jubilee models is not presently known by this web site but it is believed that this models were only acquired by Reliant Dealers and not the general public. In 1986 the Reliant Zoe Z/3000ST was created by an American company. 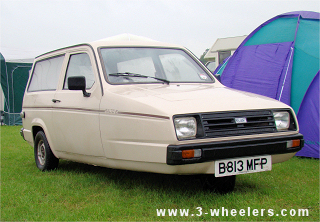 Based on the Reliant Rialto body and chassis the Reliant Zoe had an extra wide axle. It is believed that only five vehicles were produced and were they initially offered with a choice of hybrid or electric power. The Rialto was manufactured along side the new Robin until 1998 when Reliant moved to their new premises at Burntwood where they continued to just manufacture the Robin. Of all later Reliants the Rialto is perhaps one of the most under rated despite its performance and stability.